The XMT-175 Express Mount Kit for Vee Pro Spreaders. This kit includes a heavy-duty steel subframe that mounts directly to the truck bed base. The frame surrounding the spreader easily slides into the subframe and locks the unit into place. 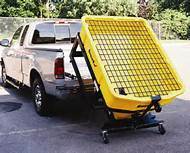 For removal, two people can activate two quick-release levers and slide the spreader out of truck bed — with the entire process taking less than a minute. Fits both the Vee Pro 6000 and Vee Pro 8000. This Express Mount Kit helps with installation and removal of unit and also allows for easy movement to storage.